Deutschland ist in aller Welt bekannt für sein Brot. Mit einer Vielfalt von über 3000 Varianten ist das Land Brot-Weltmeister. 2014 schaffte es die deutsche Brotkultur sogar auf die Liste des UNESCO-Weltkulturerbes. Doch das traditionelle Bäckerhandwerk ist gefährdet, weil der Nachwuchs fehlt und die Konkurrenz durch große Bäckereiketten und billige Backshops immer größer wird. Für The Big Pond folgt die Produzentin Iris Ollech dem verlockenden Duft des Brotes. Sie steht nachts um eins mit dem Bäcker Charly in dessen Backstube, trifft den Besitzer einer der wenigen verbliebenen Wassermühlen Deutschlands, fragt einen Brotsommelier nach dessen Empfehlungen, kostet köstliche Semmelknödel und spricht mit überzeugten Brot-Liebhabern. Male Speaker: Americans love their burger buns, French their baguettes, in southern Europe they eat ciabatta and flatbread. But nowhere else there are more different types of bread than in Germany: from light to dark, from fine to hearty – something for every taste. Male Speaker: Over 3000 different types, including such original creations as fitness bread, jogging bread, Viking bread or even world champion bread. Since 2014, German bread culture is even an immaterial world cultural heritage, recognized by UNESCO. Male Speaker: The fact that the Germans are world champions in bread today is also due to the existence of a multitude of small states and statelets over the centuries. In the Middle Ages, Germany consisted of many small duchies and independent cities. The bakers of each region produced their own specialties. To this day, people eat more rye bread in the north and west and more wheat and spelt bread in the south. Male Speaker: For a good loaf of bread, you need little more than flour, water, perhaps some yeast and salt. Plus a pinch of fantasy, a handful of knowledge and a lot of passion. Karl “Charly” Sonntag: That's milk, sugar, salt, butter, now we'll add flour, yeast, and then we'll get them going. These are sweet buns, sweet buns without raisins, sweet buns with raisins. Female Speaker: Charly, as he is called, heaves the finished dough with strong arms onto the floured worktop and leaves it to rest. Then he buries his hands in the tough mass, rolls and kneads it, cuts pieces with a spatula and forms tennis ball sized loafs from them. But this is only the beginning. 25 types of bread and almost 20 types of bread rolls are shoved into the ovens this night, from which a seductive scent emanates. Karl “Charly” Sonntag: We make bread with apples and onions, which is called “heaven and earth” here in the Rhineland, or a special bread with speck and onions, these are all our own creations. People seem to like these varieties, they are selling well. Female Speaker: Baker Charly attaches great importance to high-quality regional ingredients. He obtains part of his flour from the neighboring village of Villip, from one of the last artisan grain mills in Germany. Alexander Bedorf: Look at the wheel just starting to run. We put water on the wheel, and now the mill is powered by water. Female Speaker: ... explains the miller, Alexander Bedorf. The 46-year-old runs the historic water mill in the 11th generation. It was first mentioned in a document in 886. Fed by three small rivers, the mighty mill wheel does its work and ensures that flour is made from grain. Female Speaker: The old half-timbered house is vibrating on all its three levels. First, wheat, rye and spelt grains are sieved to clean them thoroughly. Female Speaker: They are then broken open and crushed between rotating rollers. Female Speaker: And finally, they are ground by the millstone in three cycles, resulting in wholemeal meal and flour. Miller Alexander Bedorf stands in front of a mountain of bulging flour sacks, each weighing 25 kilos. Compared to industrially ground flour, his flour has its own unique character. Alexander Bedorf: It is always said that whole meal flour becomes more fluffy when it is ground on the millstone. It is very popular, above all now with customers who do their own baking, so it’s again the craftsmanship that is honored. It seems to have its charm, as shown by our many customers. Male Speaker: The little mill shop is almost always busy. Here, Alexander Bedorf and his mother sell grain, seeds, muesli and homemade baking mixes. And of course the freshly ground flour that is just being weighed for customer Anne Clarenbach. Anne Clarenbach: We like the products with as little machine treatment as possible. Here they come directly from the people, and I think that makes the difference. Male Speaker: The American Susan Brunnert is also a customer of the mill. Susan, a musician, moved to Germany over 30 years ago for love's sake. She doesn't feel homesick for American bread. Susan Brunnert: When you’re here, you just get fantastic quality bread. Male Speaker: Even so, she prefers to bake her own sourdough bread, a hearty German specialty. Her cozy kitchen is filled with the intense smells of the freshly baked loaf she has just taken out of the oven. Susan Brunnert: Look at it, the edges are all brown, and it’s very high, and it looks fantastic. Male Speaker: The secret is the leaven which Susan Brunnert keeps like a treasure in her fridge - a glass with a screw-on lid containing a bubbly brownish liquid. It is the gift of a friend who lives in London, missed the taste of his homeland and started baking. Male Speaker: She “feeds” it with flour and water and keeps it alive. Lactic acid bacteria and yeasts ensure the fermentation, which later allow the dough to rise nicely. Susan Brunnert: You have to put 25 grams of sourdough in a bowl, you put 50 grams of rye flour, whole wheat rye, in the bowl and 100 grams of warm sink water. You mix it and put a cover on it and you go to bed. And the great part about that is, you know, it starts to get working overnight. Male Speaker: A dough that is allowed to sleep at night in order to unfold its power, that's just the way Thomas Schmitt aka "Tom the Baker" likes it. The 38-year-old is some kind of sourdough whisperer. Thomas Schmitt: Every single piece of dough, I first touch it and sort of ask it with my hands what it is that it wants from me. If the dough is very firm, you have to treat it gently, leave it to rest, leave it alone. And everything that has happened inside, all that nature has done, acid formation, air, fermentation, leave it there, do not wreck it, leave it. Treat it like your own child. Female Speaker: Tom reveals his secrets at courses and baking events, that evening together with his colleague Jörg Schmid, the "Wildbaker", in his bakery near Stuttgart. Combining traditional know-how with original ideas is the recipe for success of the Wildbaker. With his own Youtube channel and cool creations like green tea pumpkin bread, flambéed Chilly-Cheese-Twisters and a "Surfbread" that can even brave the waves, he wants to free his profession from its dusty image. Jörg Schmid: It's a pity that in the land of bread our craft has such a bad reputation. And that was the main reason to start the Wildbakers initiative, to make people aware of our beautiful craft, in the quiet hope of regaining their interest in it. Female Speaker: On average one bakery closes per day in Germany because there is a lack of new blood. Karl Sonntag from Charly's Backstube is worried, too, about what will happen when he retires in two years' time. Karl “Charly” Sonntag: There are no young people who want to continue the business, they couldn’t care less. There is no working day with less than 10, 12 hours, and then of course, you work every Saturday, every Sunday. People don't want that anymore. Female Speaker: Baker Charly is also worried about competition from large-scale bakeries and prebake stations in supermarkets or petrol stations, which just finish frozen dough pieces. Karl “Charly” Sonntag: In the future, there will probably only be these finishing shops, and that's very sad, the taste will be gone. Female Speaker: People who buy cheap prebaked bread have less qualms about throwing it away. And because many customers expect to find a large selection of bread until the time the shop closes, and it can’t be sold the next day, close to a third of all bakery goods end up in the bin. According to estimates by the environmental protection organization World Wildlife Fund, in Germany around 1.7 million tons are discarded every year. But there are ways to conjure up something delicious from old bread. Male Speaker: Someone who knows that is the owner of the “Villa Weingärtner” in the romantic red wine town of Unkel on the Mittelrhein. Daniela Weingärtner offers stylish rooms for wedding parties, birthday parties or anniversary celebrations in her estate from 1862. And she likes to treat her guests to her specialty, bread dumplings, Semmelknödel in German. Daniela Weingärtner: You know, when you try to make these quite famous Semmelknödel, it’s a traditional recipe from South Germany, from Bavaria, you really need very dry bread. This is the whole secret. Normally, German people, they quite often go to the bakery and buy these small white breads called “Brötchen”, and in the south of Germany we call them “Semmeln”. Daniela Weingärtner: It’s a very good method if you don’t like to throw food away. It’s a very good possibility, because it tastes delicious, people like it, it’s cheap, it’s always available, and you have the good feeling that you don’t waste your food. Male Speaker: For her bread dumplings, Daniela Weingärtner soaks the dry bread in milk, mixes it with chopped onions and rendered speck. Add salt, pepper and a good pinch of nutmeg, form dumplings and pop them into boiling water. Daniela Weingärtner: And then we have to wait for another 20 minutes or so. Daniela Weingärtner: So, now I would say, enjoy your Semmelknödel. Female Speaker: Bread dumplings, a typical specialty of Southern Germany. Just like pretzels, which are popular in many places outside Germany. Wildbaker Jörg Schmid from the Stuttgart region explains the regional characteristics. Jörg Schmid: In general, the difference between pretzels is very big, so within the country there is a lot of variety. With us they are clearly more greasy, more fat-rich, more butter, or some bakers also add a little pig lard. That's how it used to be. With our neighbors, the Bavarians, they are somewhat drier, so you always have to drink a large jug of beer with them. Jörg Schmid: The peculiarity of Pumpernickel is that it is made from whole rye grain, that is on a rye meal basis with a sourdough and has a minimum baking time of 16 hours, and this is how it gets its delicate malty-sweet flavor. Female Speaker: But what would Germany be without its legendary Butterbrot? A meal in itself, whether in the morning, at noon, in the evening or as a snack, it is a pleasure at any time of the day. Jörg Schmid is also a bread sommelier, and just as a wine sommelier recommends a good drop to go with a meal, he knows the ideal topping for any type of bread. Jörg Schmid: The basis for the perfect Butterbrot in my mind is a sourdough bread with spices, and then, for the classic version, you have to spread lots of butter, add a pinch of salt, and, if available, maybe some chives. Female Speaker: And Schmid's colleague “Tom the Baker” – what comes to his mind when he thinks about Butterbrot? Thomas Schmitt: Crunchy crust, sourdough, grandmother, grandpa, butter, salt. Being at home. Female Speaker: So bread is more than just a food that fills your stomach. It is connected with memories, feelings and a taste you never forget. This is also how journalist Jacqueline Schäfer experiences it. She grew up with bread from Charly's bakery in the Rhineland, moved to Bavaria to study and now works in Berlin. Jacqueline Schäfer: Bread is like language. It's like a dialect. In Germany there are so many regions, and so many dialects, and so many kinds of bread, and in each single case, both the language and the bread mean Heimat. Female Speaker: Baker Charly also knows this feeling from his customers, this longing for a home, for Heimat. Karl “Charly” Sonntag: I notice when people come back from holidays, from Spain, France, or wherever, they first come here and say, at last a decent loaf of bread. Female Speaker: If master baker Charly could take just one loaf of bread of his choice with him to a desert island, which would it be? Karl “Charly” Sonntag: I like sourdough bread best, quite savory, well baked, thick crust, that's what I like best. I couldn't imagine being without bread. Female Speaker: After a busy night, it's done. The first fresh loaves will be on the shelves of Charly's Backstube from 05.30 a.m., the whole range. His wife Maria has been serving customers with enthusiasm for 45 years. Maria Sonntag: Here we have fantastic loaves of bread, all made with natural sourdough. Over there, that‘s wholemeal breads, with and without grains, there are light-colored breads, there are beautiful caraway and nut breads, rye bread, baguette bread, and then of course the variety of our rolls, so that for every morning and for every breakfast table, there is always the right choice. Female Speaker: Just like the German world champions in bread love it. Iris Ollech ist freie Autorin in Bonn. Sie arbeitet unter anderem für den Ereignis- und Dokumentationskanal Phoenix. 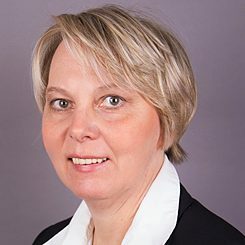 2008 erhielt sie, anlässlich der Präsidentschaftswahl, ein Stipendium der RIAS Berlin Kommission. Ihre allererste große Reise führte sie Mitte der 1980er-Jahre quer durch die Vereinigten Staaten. Auf ihrem spannenden Trip vermisste sie nur eines: das heimische Brot. Grund genug, sich für The Big Pond mit der legendären deutschen Brotkultur zu beschäftigen. Kaffee ist mehr als nur ein Getränk – er sorgt für einen Kick-Start in den Arbeitstag und darf auch bei einem gemütlichen Nachmittag mit Freunden nicht fehlen. In dieser Folge zeigen wir, welche Bedeutung der Kaffee in verschiedenen Kulturen hat. Dafür begeben wir uns von Baltimore bis nach Berlin und stellen auch die typisch deutsche Tradition des Kaffeeklatschs vor. Seit mehr als einem Jahrhundert prägen deutsche Unternehmer und Weinbauern die Weinherstellung in den USA. Unser Produzent Gary Lee nimmt Sie mit auf eine Tour durch drei US-Weinberge mit überraschend deutschen Wurzeln und zeigt Ihnen, wie sehr diese Branche in den USA nach deutschem Vorbild agiert. Innerhalb der historischen Mauern der Zion Lutheran Church in Baltimore, Maryland, kann man sowohl Polka-Bands als auch Orgelkonzerte hören. Seit über 250 Jahren ist die Gemeinde ihrem deutschen Erbe, das Immigranten nach Baltimore brachten, treu. Mittlerweile ringt die Zion Church um die richtige Balance, um zukunftsfähig zu bleiben.